The first one is the one with the lowest core count (4/6 cores), which is found in SKUs targeted at the workstation and enthusiast market (high frequencies) or low power SKUs; this is the core being used in the enthusiast Ivy Bridge-E processors. The second one is targeted at the typical server environment with higher core counts (6 to 10 cores) and a larger L3 cache (25MB). The third and last one is the high performance HPC and server die, with 12 cores, two memory controllers for lower memory latency, and 30MB of L3 cache. 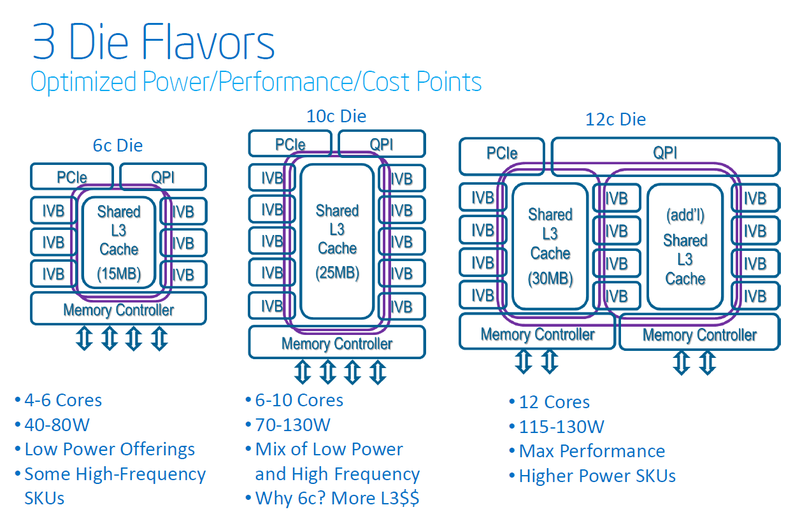 The cool thing about the newest Xeon E5 processors is that they run on the same Romley EP platform as LGA-2011 chips. This should save the OEMs a lot of time and money, and hopefully these savings will trickled down to the customers. Let's see how Intel's latest server update performs, and if it manages to impress more than the enthusiast Ivy Bridge-E. 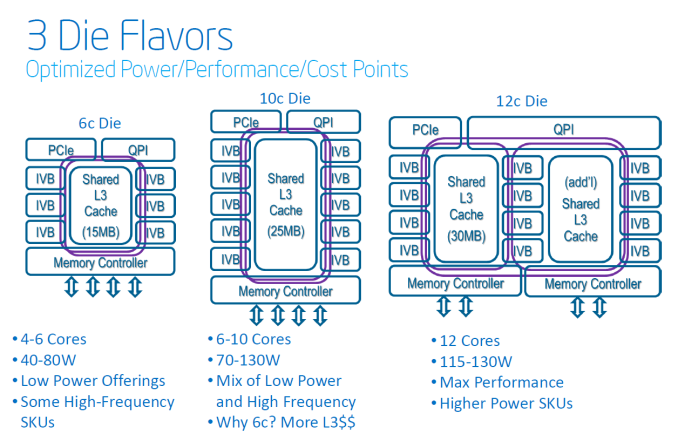 Odd that Intel went the 3 die route with Ivy Bridge-EP. It was no surprise that the lowend would be a variant of the 6 core Ivy Bridge-E found in the Core i7-4900 series. Apple leaked that the line up would scale to 12 cores. The surprise is a native 10 core part and the differences between it and the 12 core design. Judging from the diagrams, Intel altered its internal ring bus for connecting cores. One ring goes orbits around all three columns of cores while another connects two columns. Thus the cores in the middle column have better latency for coherency as they have fewer stops on the ring bus to reach any core. 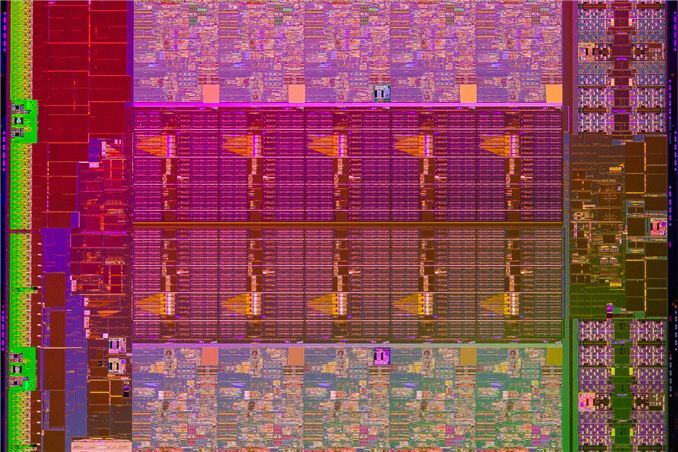 The outer columns should have similar latency than the native 10 core chip for coherency: fewer cores to stop but longer traces on the die between columns. Not disclosed is how the 12 core chip divides cache. Previously each core would have a 2.5 MB of L3 cache that was more local than the rest of the L3 cache. The middle column may have access to L3 cache on both sides. There will be 15-core E7 8xxx v2 CPUs based on the same IvyTown architecture. I would have expected this newest Intel 12-core cpu to perform better. For instance, in Java SPECjbb2013 benchmarks, it gets 35,500 and 4,500. However, the Oracle SPARC T5 gets 75.700 and 23.300 which totally demolishes the x86 cpu. Have not the x86 cpus improved that much in comparison to SPARC? The x86 still lags behind?